Make a career move and get qualified by becoming a Surfing Judge and Official. The role of a Judge in a surfing contest is to decide which surfer performs closest to the judging criteria in a particular heat. It is therefore essential that the judges have the knowledge, confidence and the experience to obtain the correct results. The education of our sport's Judges and Officials is paramount to the direct success of the competition system. Surfing Australia are committed to providing a clear development pathway for aspiring and current dedicated experienced Judges and Officials. The International Judging and Officiating Courses are the first step in becoming a professional surfing Judge and Official in all disciplines of surfing including Short boarding, Long board, Knee boarding, SUP and Body boarding. Surfing Australia Judging development courses are recognised as the only Surf Judging qualification courses by the Australian Sports Commission and the International Surfing Association. The International Judging and Officiating courses are being regularly conducted in many major surfing regions around our coast line and in conjunction with our state branches. 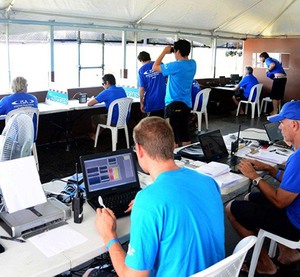 The International judging courses are being conducted throughout the ISA surfing world with countries that are partners in the global Judging and Officiating Program. (JOP) The International judging qualification gives the individual judge access to the ISA Judging exchange program and the ability to judge at all ISA sanctioned events. There are currently 32 countries that are partners in the global development program. Surfing Australia manages a database of Australian registered accredited and fully Insured judges and officials. This register will be accessed by state branches to establish current registered officials for judging opportunities at sanctioned events. All current and accredited Judges are covered under the SA Insurance policy which covers the Judge and Official under $5,000 000 Professional Indeminty and $20,000 000 Public Liability coverage. In December, all judges that have completed The International Judging and Officiating Course are required to renew their annual registration to maintain accreditation and judging qualification. There are currently three (3) registration levels available for Australian Judges and Officials. Surfing Australia utilise the International registered judges’ data base to establish current International registered judges as part of the selection process for National and International events.